A heartland nonprofit aims to help farmers tap the environmental benefits of long-lasting crops. 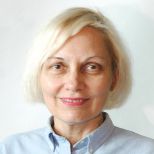 Writer Margaret Buranen Margaret Buranen is a writer based in Lexington, Ky.
March 4, 2013 — Plant scientists at the Land Institute in Salina, Kan., are convinced they are on the path to finding the best way to feed an exploding world population. They are working to create new perennial varieties of grains that will flourish in a prairielike ecosystem and yield results comparable to annual crops. Early farmers had hungry people to feed and no knowledge of genetics or agronomy. They simply began cultivating whatever crops grew the fastest. That meant annual plants — plants that grow for a single season — were the crop of choice instead of perennials, such as long-lived grasses, for agriculture’s first steps. Annual varieties have large yields, but land for growing them has suffered since their cultivation began. Agriculture has remained focused on annual crops for a reason. “Our imaginations have been limited because of the availability of fossil fuels,” Jackson says. With adequate gasoline to power farm machinery, agronomists have concentrated on improving well-established annual crops. They haven’t thought about other crops that grow more in harmony with nature. Jackson is encouraged, though, by how many people — especially young scientists — are interested in a promising alternative: developing perennial varieties of grains to feed the world and growing them in a diverse ecosystem that replicates the prairie. That’s the work being done at the Land Institute, which he founded in 1976 to develop grain crops that would grow sustainably. Perennials start off at a disadvantage to annual plants because there is little crop the first year. But once perennials are established, benefits abound. Annuals start off too small to soak up early growing season rainfalls; that means spring rains falling on annual crop fields often become runoff carrying nutrients and fertilizers that pollute nearby lakes and rivers. With their massive, diffuse root systems, on the other hand, perennials “are elegant micromanagers of nutrients and water,” Jackson says. Roots in the soil sample on right, collected more than 3 feet deep in a meadow of perennial prairie plants, feed the soil’s many living organisms. The teeming life in turn builds dark healthy soils. 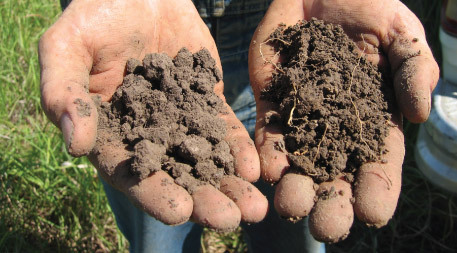 The lighter soil on the left was collected at the same depth from an adjacent annual crop field. Photo courtesy of the Land Institute. Perennials offer other advantages as well. Because the soil remains covered with vegetation year round and doesn’t have to be tilled before planting every year, it isn’t lost through erosion. And since weeds have a tougher time gaining a toehold among thriving plants, herbicides generally aren’t needed. 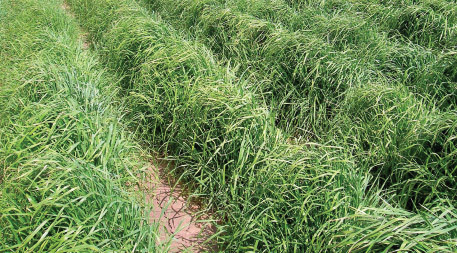 Growing annual crops requires extensive use of fossil fuels to power farm machinery, and labor to grow annuals is much more extensive than that needed for perennial grains as well. Once planted, perennials generally require harvesting and minimal maintenance, while annuals require planting and harvesting plus applications of fertilizers and herbicides each year. Jackson and other scientists at the Land Institute have spent more than 30 years working to develop perennials that make sense for modern farming. They’re currently working on developing high-yielding, disease-resistant perennial varieties of four grains: wheat, wheatgrass, sunflower and sorghum with plots grown by researchers at universities in Canada, the Netherlands, and several other countries with a range of climates. In addition, in China, Hu Fengyi of Yunnan Academy of Agricultural Sciences is working with the Land Institute on developing perennial rice. Intermediate wheatgrass is one of four perennial grains undergoing improvement at the Land Institute. Photo courtesy of the Land Institute. Developing perennial grain plants that produce consistently high yields and are tolerant of heat and other conditions is slow, painstaking work: Unlike annuals, which commonly self-pollinate, perennials are commonly out-crossers, accepting pollen only from other plants. That means it takes many more generations to breed desirable traits in and undesirable ones out. Yields are increasing on the perennial grain plants, but they are not yet equal to their annual counterparts. The Land Institute scientists know farming is financially risky, so they want farmers to have perennial grain plants that are economically worth growing. Jackson says it will take a few more years before perennial grain plants are productive enough for farmers to grow them in plant trials. He anticipates that one or more of the crops will be ready for farmers to grow in field trials in a simple polyculture of at least two crops in 10 or 12 years. Eventually he will add perennial corn and soybeans to the Land Institute’s research work. What’s the most challenging part of Jackson’s work? “Raising money,” he says. The Land Institute funds its research through donations from foundations, individuals, businesses and competitive grants. But with attention to sustainable agriculture increasing, it expects to collaborate with more public institutions to direct more research into agriculture that works with nature.